MIT on Saturday hosted an “Innovation to Impact” forum focused on Saudi Arabia, bringing together governmental leaders, business executives, and academic researchers in an effort to analyze and catalyze new directions for the Saudi economy and to discuss areas of shared interest. 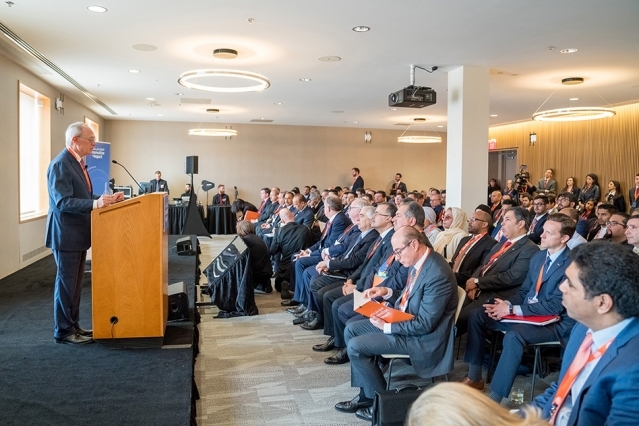 The event’s participants included a royal delegation from Saudi Arabia, members of the MIT administration and faculty, and chief executives from several prominent Boston–area companies. Among the other components of the forum, separate, simultaneous roundtable discussions examined the state of health care, renewable energy, and the dynamics of entrepreneurship and venture capital. At the conclusion of the forum, MIT hosted an event in the MIT Media Lab that featured an “innovation gallery” of new technologies; presentations by Greater Boston students and scientists from Saudi Arabia; and demonstrations of new technologies. His Royal Highness Prince Mohammed bin Salman, Crown Prince of the Kingdom of Saudi Arabia, participated in that second event, which included a signing ceremony to finalize a series of research and education collaborations with MIT and other area institutions. The agreements extend existing collaborations and establish some new programs supporting research and education. The visit comes as Saudi Arabia is launching a long-term economic transition, intended to add leading-edge industries to its traditional focus on natural resources, and to provide greater opportunity for all its citizens, seventy percent of whom are under the age of 30. H.E. Khalid Al-Falih, Minister of Energy, Industry, and Mineral Resources in Saudi Arabia, delivered a keynote address at the event on Saturday morning, and called it “very significant” that the Saudi delegation had made the Saturday forum its second main stop on a three-week, seven-city tour of the U.S.
MIT President L. Rafael Reif remarked on the expanded research and education collaborations in welcoming remarks he made at the outset of the day’s proceedings. The forum centered on Saudi Arabia’s “Vision 2030” project, an effort by the country’s leaders to diversify its national economy and develop new industrial strengths, at a time when economic and demographic uncertainties are on the horizon. Vision 2030, which was announced in April 2016, is designed to increase non-oil revenues in Saudi Arabia sixfold by 2030. The project calls for greater activity in the sectors of services, logistics, health, advanced manufacturing, and education, among other areas, along with a greater emphasis on private-sector enterprise. Vision 2030 also supports new investment in renewable energy, as well as greater social inclusion within the future Saudi Arabian workforce. MIT (and other U.S. universities) participated in a first “Innovation to Impact” forum in Saudi Arabia in May, 2017, hosted by the King Abdullah University of Science and Technology (KAUST). MIT President Reif helped lead that event, which also looked at new opportunities in industry, research, and education. Al-Falih, who has been a central figure in the development of Vision 2030, first spoke at MIT about the plan in 2016, and on Saturday again emphasized Saudi Arabia’s commitment to the high-profile project. “The most important investment that companies make is investing in innovation, and taking risks on ideas and people,” said Al-Falih, who has held multiple positions in the Saudi Arabian government and served as CEO of Saudi Aramco, the oil and gas producer. Saudi Aramco is also a founding member of the MIT Energy Initiative (MITEI), the Institute’s main organizational hub for energy research and education. As part of that commitment to innovation, Al-Falih emphasized, Saudi Arabia is prepared to engage with a variety of promising innovation-driven industries. Israel Ruiz, MIT’s executive vice president and treasurer, gave a talk to the entire audience analyzing the building blocks of the innovation ecosystem of Massachusetts — including MIT’s home base of Kendall Square in Cambridge, where several technology-based industries have grown significantly in recent decades. While having talent, funding, and lab space in close proximity are essential components of the local innovation ecosystem, Ruiz noted, a “critical thing is to have the bold vision” necessary to support the process of research, discovery, and development. The MIT-hosted forum also included a panel discussion on NEOM, a planned new destination in Saudi Arabia intended to serve as a site for the application of leading-edge technologies, including advances in mobility, robotics, and energy. MIT’s long-term engagement with Saudi organizations and leaders includes the creation, through the support of Community Jameel and its chairman, Mohammed Abdul Latif Jameel ’78, of the Abdul Latif Jameel Poverty Action Lab, founded in 2003, a global research lab that uses scientific evidence to combat poverty; the Abdul Latif Jameel World Water and Food Security Lab, created in 2014; and the Abdul Latif Jameel World Education Lab, which was created in 2017 to spark a renaissance in global education, including among underserved populations. Several collaborations discussed on Saturday covered a diverse set of activities linking MIT and Saudi Arabia, and are largely focused on research and the development of new technologies. One letter of intent, between Saudi Aramco and MITEI, expresses an intention to establish a new five-year collaboration to develop breakthrough solutions for global energy and climate challenges. The support would build on past collaboration between MITEI and Saudi Aramco, and would fund wide-ranging areas of research including sustainable and renewable energy; carbon capture, utilization, and storage; environmental sciences; energy storage; water conservation and reuse; advanced materials; and computational modeling, artificial intelligence, robotics, and nanotechnologies. Additionally, the Saudi Basic Industries Corporation (SABIC) agreed to fund the design and testing of a new type of reactor for combustion pyrolysis of methane. Other MIT-Saudi agreements signed on Saturday strengthen already-existing programs and include educational components. One agreement extends the scope of the Ibn Khaldun Fellowship, a program established in 2009 that helps the development of Saudi Arabian women scientists and engineers by facilitating year-long research projects at MIT. Another agreement further develops the Center for Complex Engineering Systems, a collaboration between MIT and the King Abdulaziz City for Science and Technology (KACST). The strengthened program involves research collaboration, professional training, and a scholarship program for graduate students. Other agreements unrelated to MIT that were also signed at the forum included one between KAUST, Research Products Development Company RPDC, and Saudi VAX. This agreement will establish the Saudi Vaccine and Bio-manufacturing Center at KAUST. Also, a collaborative agreement between KACST and Brigham and Women’s Hospital for the Center of Excellence for Biomedicine will focus on three key medical research projects. This article has been updated to clarify the nature of some of the agreements discussed at the forum.